You know what's a good parse? we must be some kind of geniuses! Oh second best dps on Zul though. Go me. Me and javen walked through. Shirls cheated with divine shield, saw the whole raid died and followed us through the barrier afterwards. I wish I could make raids and do things more consistently, but one of my jobs has gotten more busy in recent weeks, and just culminated in me taking over as acting managing editor for the next few weeks. Which is cool, but I’d also like to hang with you guys more often also. "That's right! TWAS I THAT SET TELDRASSIL ABLAZE"
Just a heads up, I am likely out of commission until the end of the week. I can barely move atm. I dated to hope that I would be able to reincarnate, Feral Lunge to the boss before the fire got me again due to latency or something, and be alive for the kill. In retrospect, the barrier was likely blocking my line of sight. And even then, I would have had so little health that I would have essentially been a fly going into a bug zapper with the barrier. ...which I honestly think would have been hilarious. Oops that's me. It can't handle my NULL dps. How do i get to that graph? I clicked around some but it tends to lock up on my phone. With gear + another stack of reorigination array we can definitely get it without anyone dying next week! Death Denied (Priest):	Leap of Faith absorbs the next 1,840 damage to the target within 10 sec. While the shield holds, Leap of Faith cools down 200% faster. If the shield were MUCH bigger, I could see that trait being good. But practically speaking, more life grips seem very useful when you're getting a bunch of sudden pressure from the DPS, since they seem to back off quick if they start getting hit back. Fuuck, anything for more life grips, please. And woo, heroic G'huun down. Execution parse: 10th percentile (I don't think those are normalized for raid size, are they?). Healer stress: 90th percentile. So my thoughts are that heroic ghuun is a bad fight that no one important likes. So we should do mythic mother on thursday. 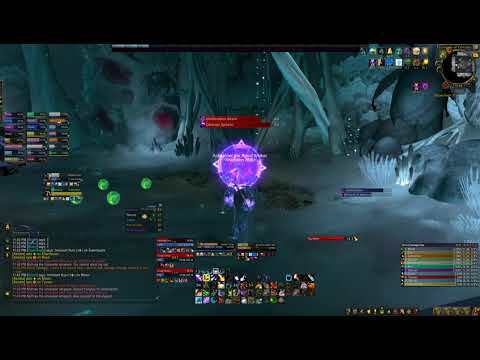 So I tried it out in LFR, and demon hunters can in fact solo orbs pretty quickly and easily, but it requires the leap from meta to do before the orb roots you entirely. Hey you did it, you did the good thing. Which is good because all I did after was lay in bed dying! And that one boss, the flu boss. We should try both gimmick strats simultaneously.